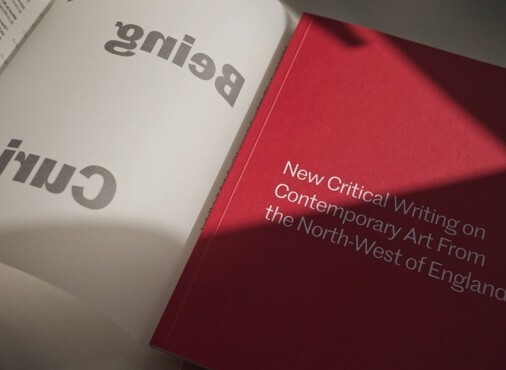 With a foreword by Lancaster Arts curator Richard Smith; On Being Curious: New Critical Writing on Contemporary Art From the North-West of England is a new book edited by Laura Robertson. Published by The Double Negative on behalf of Contemporary Visual Arts Network North-West (CVAN NW) 10 new articles on contemporary art from 10 emerging writers: On Being Curious is a book telling the story of the North-West’s contemporary visual art scene, yet contributes to national and international debates around what it means to make powerful, arresting and effective arts practice. The first book edited and published in house by The Double Negative magazine, On Being Curious has been commissioned by the Contemporary Visual Arts Network North-West (CVAN NW), as part of their successful Critical Writing Bursary & Workshop Programme (2014-16). It is funded by Arts Council England, Lancashire County Council, University of Salford, Manchester School of Art and arts organisations across the North-West. The writers’ chosen topics include award-winning artists, projects, exhibitions, art schools, agencies and artist-led venues, and provide a rich snapshot of the contemporary art scene in the region from the last 18 months. On Being Curious editor Laura Robertson said: “On Being Curious just goes to show what can be achieved by providing emerging writers with clear and constructive editorial support; editorial contacts at publications; networking and skills-building; and critical writing bursaries. I feel very honoured to have been part of this book and the wider CVAN NW Critical Writing Bursary & Workshop Programme.”On Being Curious has been praised by frieze magazine’s Jennifer Higgie, a-n’s Chris Sharratt, and ArtReview’s Oliver Basciano –who commented: “This book provides 10 smacks in the face to the idea that art criticism is dead. Art needs to be interrogated, artists’ ideas stretched and pummelled, loved and lauded: the writers contained within these pages do all this and more, with verve and humour, hitting points and making targets with scary panache.”On Being Curious will be available in a selection of public and university libraries across the North-West and the UK, including at the British Library.